When people think of products like Invisalign, they imagine a straighter-looking smile. However, the benefits of Invisalign extend beyond a straighter smile. It also provides benefits to other parts of the mouth, not just your teeth. During your next visit with your cosmetic dentist in Tequesta, keep Invisalign in mind as the perks of straight teeth could benefit several aspects of your overall health. Did you know that swollen, red gums can occur as a result of crowded teeth? Teeth that are crowded or too widely spaced can leave them more vulnerable to periodontal disease. With aligned teeth, the gums fit more securely around them, providing a stronger defense to periodontal problems in the future. Unfortunately, metal braces can irritate the soft tissue in your mouth, whereas plastic clear aligners carry virtually zero irritation. Plus, if you have allergies to certain metals, plastic Invisalign products could be a better alternative to braces. It’s common for food debris to get stuck in the metal brackets and wires found in braces. If food remains in the mouth, plaque will build up more quickly, which can lead to tooth decay. Since Invisalign’s aligners are removeable, eating food is never a concern for those transforming their smile. Removing food is as simple as brushing and flossing your teeth like you did before Invisalign. With these benefits, retaining your oral health as well as overall health is significantly easier compared to braces. According to the American Dental Association, poor oral health can result in oral infections that can cause a slew of other issues unrelated to your mouth at all. These serious ailments include, heart disease, stroke, pneumonia, and even diabetes. 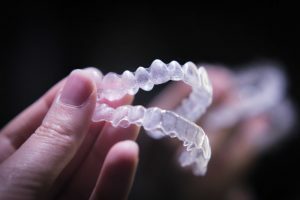 Since Invisalign aligners make cleaning teeth easier, both before and after they’ve been straightened, the likelihood of contracting other diseases is largely reduced. Furthermore, straighter teeth provide a better bite, which aids in chewing, speaking, jaw problems, and reduces wear on tooth enamel. Invisalign in Tequesta offers many benefits, not just straighter teeth. Ask your dentist during your next dental visit if clear aligners are right for you! Dr. Greg Riley earned his Masters of Science degree at the University of Miami followed by his Doctorate in Dental Medicine at the Temple University School of Dentistry. With over 20 years working at his practice, Dr. Riley is dedicated to enriching and enhancing patients’ lives after ever visit. He is also a member of several dental associations, including the American Academy of Cosmetic Dentistry and the Florida Academy of Cosmetic Dentistry. To learn more about his practice’s Invisalign treatments, contact him at (561) 622-7243 or visit his website.